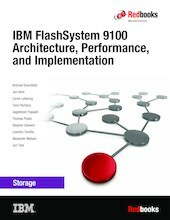 IBM® FlashSystem 9100 combines the performance of flash and Non-Volatile Memory Express (NVMe) with the reliability and innovation of IBM FlashCore® technology and the rich features of IBM Spectrum™ Virtualize — all in a powerful 2U storage system. Providing intensive data driven multi-cloud storage capacity, FlashSystem 9100 is deeply integrated with the software-defined capabilities of IBM Spectrum Storage™, which allows you to easily add the multi-cloud solutions that best support your business. In this IBM Redbooks® publication, we discuss the product’s features and planning steps, architecture, installation, configuration, and hints and tips.